I recap our third Shadowrun adventure, “The Bodyguards,” from rock concert chaos to stealth infiltration at a mansion. 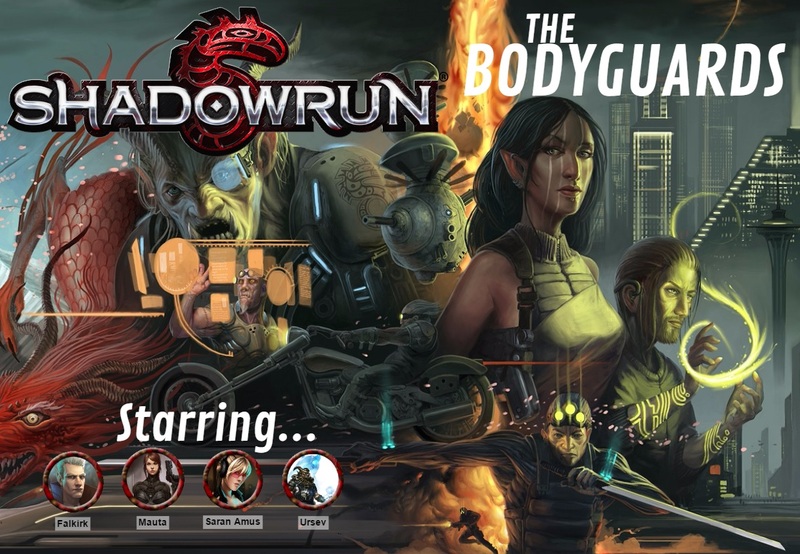 When my friends and I first became interested in rekindling our online role-playing sessions from last year, I immediately suggested Shadowrun. The decidedly 80stastic cyberpunk-meets-fantasy world is just incredibly cool, and I was really digging the tactical RPGs being released from Harebrained Schemes. Instead of diving into some pre-generated adventures to help us get started and familiarized with the world, I opted to jump write in with writing our own missions. My initial idea was the players working security at a magical rock concert, and having to prevent a chaotic kidnapping. I thought it might’ve been a bit too much to pull of originally, so I shelved it until our third mission. “The Bodyguards” ended up lasting us six total sessions, with two shorter 1 hr weeks and one final, very lengthy 3.5 hour session. 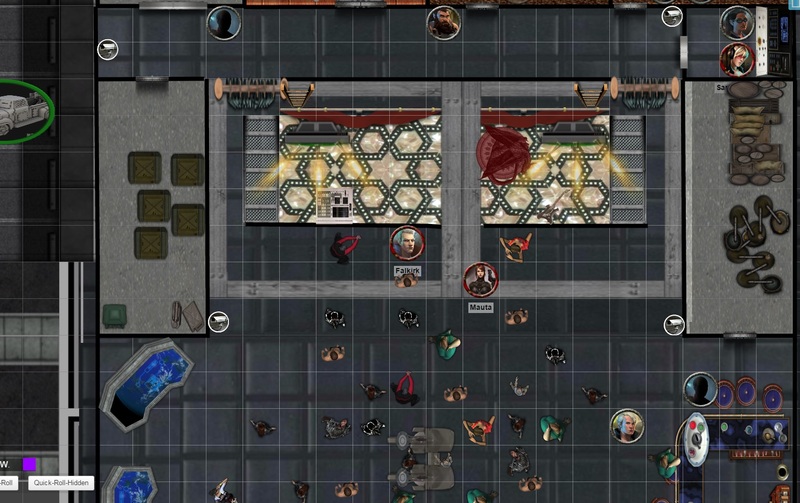 It consisted of four tactical maps in Roll20, three of which were quite large. I was incredibly excited to grow this adventure seed into a full-blown mission, though it ultimately ended up with mixed results. I encourage my players to create at least a bare-bones backstory for their characters, and I enjoy incorporating elements from their past into current adventures. In our previous mission, for example, Mauta nearly ran in to an old co-worker and boss she worked for at Ares before she went off the grid, which could’ve led to some interesting role-playing opportunities or combat (Mauta decided to avoid him entirely). This time around I used an estranged brother of Ursev, our benevolent troll shaman as the quest-giver. This gave some personal motivation for one of our players and opened up some more meaningful dialogue. The brother, Benton, offered the players the job as temp security guards for a One Night Only show for indie rock singer Lana Grace. He needed to double security, but wouldn’t divulge why. 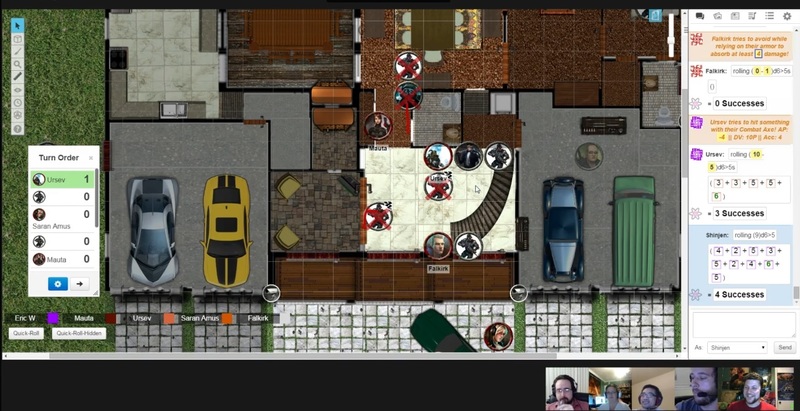 The players accepted the legitimate job and were given a chance to buy supplies as well as scout the gigantic converted warehouse location I’d built in Roll20 [Session 1 Report]. The night of the concert proved to be one of the single most enjoyable sessions I’ve had doing these online role-playing sessions. I had the major event planned with a strike team of kidnappers attacking and trying to abduct the singer. But first I wanted to explore the random events and situations that can crop up at a concert that the players would have to deal with. There was very little actual combat, other than a surprise vampire that had a backstage pass. Players had to screen the backstage passers, confront a ticket scalper, deal with a drug dealer, help an unconscious fan and deal with the inevitable streaker on stage. It was a ton of fun, from Ursev crushing both tickets and drugs in his hands and scaring people off to Mauta spotting all the trouble from up in the catwalks. It still came down to me doing things and players reacting to them, but everyone enjoyed the structure and format [Session 2 Report]. Finally Lana Grace took the stage, and I played my hand. The singer had some magical talents which helped distract everyone. Further complications arose when one of the magically-gifted attackers cast an illusion, causing a dragon to appear on stage and attack everyone. My players annoyingly resisted most of the illusions, and were able to handily defeat the kidnappers [Session 3 Report]. Shadowrun doesn’t operate with traditional levels, so when crafting my own adventures from scratch I find it difficult to balance encounters. I’d rather err on the side of easy to make things go faster and make the players feel more heroic, but by now my players have pretty much cleaved through everything I’ve thrown at them. During our epilogue session, I revealed that the story could’ve branched depending on if Lana had been captured or not, and the players admitted that losing that fight and having to rescue Lana would’ve been the far more compelling outcome. This was not the end of the adventure – I had a whole follow-up planned. The kidnappers were sent by Lana Grace’s parents, who were involved with the Yakuza and wanted her returned. She just wanted to be free of them, and hired the runners to infiltrate their mansion and steal some blackmail-able evidence. This was our first real chance for a big stealth mission, and I was inspired by games like Deus Ex and Dishonored in creating a giant area filled with guards and opportunities. Unfortunately it kinda fell apart at the end. First my players had to get inside, and I was quite impressed with their plan to mind control (a way too easy and borderline broken spell) one of the more agreeable kidnappers, using him to set up a return trip to the mansion. Falkirk dressed up as one of the strike team assassins while Mauta pretended to be the captured and unconscious Lana. This lead to an interesting splitting up of the party when they got through the gates. Saren stayed in the guardhouse downloading the floor plans, Mauta was taken to an upstairs bedroom, while the rest were able to just drive into the garage – after a little nudging from myself. I also used this opportunity to introduce a new player – a law enforcement officer that was staked outside the villa. Referring to herself as Ms. Johnson, she offered to pay the runners if they brought the evidence to her – giving my players a dilemma they would face later on [Session 4 Report]. Inside the split-party situation proved tense and fun at first as everyone scrambled to poke around. Unfortunately they didn’t really have a game plan, nor even really worked together other than stumbling around the house spotting guards [Session 5 Report]. We discussed the issues at length during this Epilogue & Recap episode. A major problem is our reliance on Roll20 – I build everything on the tactical grid, so my players naturally just respond to whatever they see. Instead of asking me more questions or trying to think outside the box, for example, they see the main set of stairs and focus on that. After becoming frustrated with their options, they decided to sneak attack the guard in the foyer. It did not go well, and we rolled for initiative. I honestly wasn’t sure my players would be able to survive a full-on assault, and that’s quickly what this turned into as more guards responded to the alarm. The guards were quite strong for random minion NPCs, rolling 10 dice on their assault rifles and 8 for defense. I also had a souped-up augmented boss that leapt down from the 2nd story and nearly killed Ursev with two blows. Two edge points later and my boss lie dead instead – another Shadowrun system that feels super cheap to me. At least this time the players wouldn’t get through unscathed. Both Mauta and Falkirk took heavy amounts of damage, and Ursev definitely would’ve died had he not used an Edge point. Saren did have a funny and tense moment as she was outside the mansion by a car, only to be attacked by a patrolling guard dog. She tried to hack the car but the powerful, custom-engineered dog broke through the windows, and she had her hands full. After a very long but tense combat sequence the players turned the foyer of the mansion into a bloodbath. They went upstairs and confronted the parents, and their exhaustion and bloodied appearance led them to get exactly what they came for. They decided to blow of Ms. Johnson and head straight for Lana – but not before some delicious deliberating that I enjoyed hearing. These actions could definitely have consequences for them in the next adventure [Session 6 Report]. We definitely learned that the team prefers shock and awe tactics to stealth, though they also enjoyed the larger focus on fun role-playing moments versus heavy combat. In fact the whole mission was extremely light on combat having only two real encounters, though the last one was a doozy. I thought “The Bodyguards” went pretty well but I also hit peak reliance on Roll20’s visual aides by using these giant custom-built maps. Ultimately I think it was detrimental as we relied on them far too much. Basically I’ve turned tabletop role-playing into a tactical wargame, and that’s not at all what I was going for. Future maps will be used sparingly. I’m also going to be using a pre-generated mission for our next adventure, “Splintered State.” That will be our final Shadowrun mission for the time being, as we plan on trying out a new RPG system in Dungeons & Dragons Fifth Edition – Coming Soon!